Let's back up. I got the trial on the 22nd for Splatoon 2 purposes. 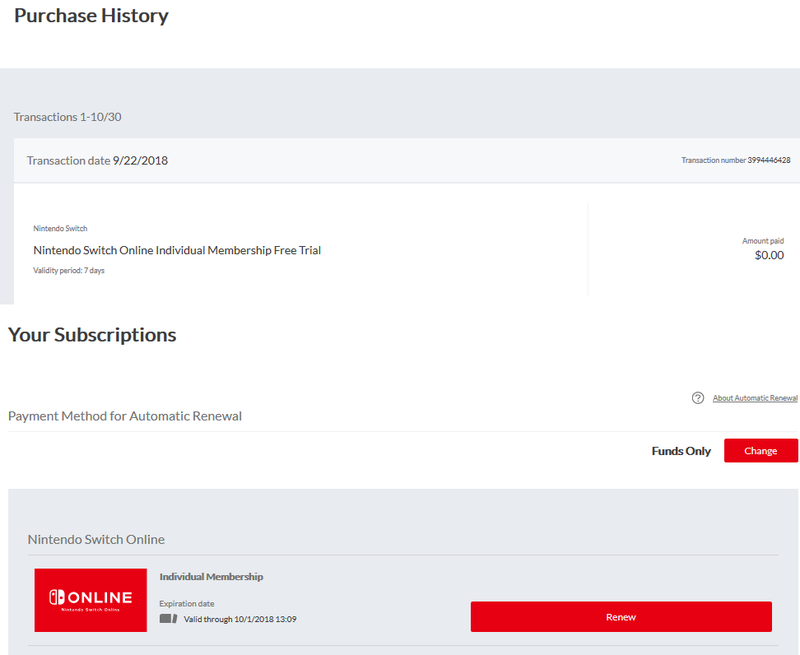 I immediately encountered a problem — one has to store their credit card number or PayPal account to access the free trial because you're automatically signing up for a 1-month, $4 Nintendo Switch Online subscription. 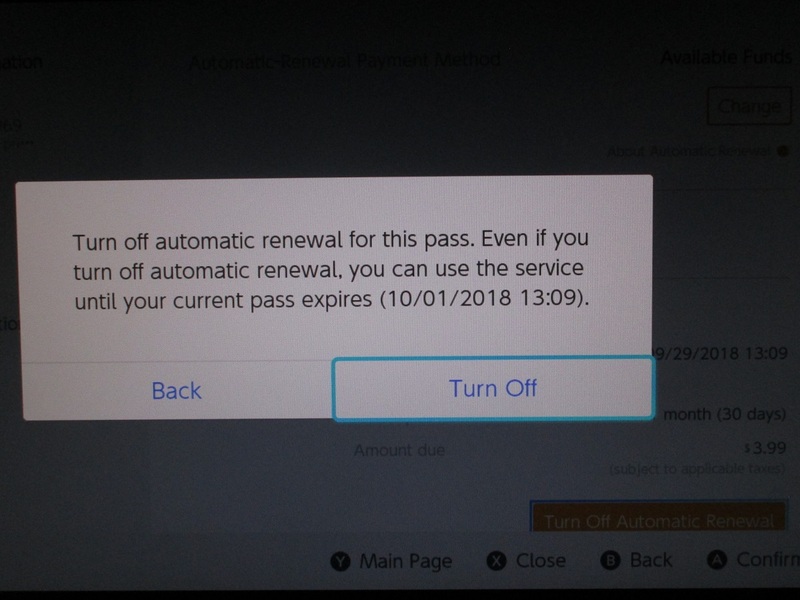 Available Funds, while an option to renew with in your eShop settings, wasn't an option to actually get the subscription to begin with. Only credit (debit) card or PayPal. Let's just say... I don't exactly trust storing my personal financial information on Nintendo's servers. You know, hackers target gamers... and gaming companies. But I had to to get the trial. So here's what I did. I entered my credit (debit) card information. Got the trial. I immediately went to the eShop settings and wiped out my credit (debit) card information from my Nintendo eShop account. I have no idea if Nintendo would still be (illegally) storing that information even after I ordered it eliminated, but that's the most I can do. I then went to the automatic renewals part of the eShop settings, switched it back to Available Funds (it was Available Funds before the trial, then automatically changed to credit card after I got the trial), and turned off automatic renewal. And then once I turned off automatic renewal, the trial end date went from September 29 to October 1. I don't know why doing something that Nintendo doesn't want me to do gets me a reward, but I'm impressed, I guess. I was so impressed that I went ahead and did what I was supposed to do this whole time — purchase a family membership for the KoopaTV Family Group. Unfortunately for me, even if I have more than double the $35 cost for the family membership, credit card information or PayPal is required for a purchase. The same is not true for an individual membership. (Though it was true for the trial.) So once more, I put my information in, only to delete it. Of course, automatic renewal is on. Or else the other KoopaTV staffers would be mad at me. Family Membership for a year from my funds. Aren't I nice? Kamek and Witch Princess are the only other members of the Family Group and they're too busy sleeping to confirm that they can use online services now. You might have noticed that I did the exact opposite of my big article on sticking it to Nintendo. I got the trial... and then converted off of it to the most expensive plan possible. With auto-renewal. Nintendo is going to look at me as a success and a data point that Nintendo Switch Online is a good value. Ludwig doesn't have a credit card, so he really doesn't want his bank account scammed by unethical Nintendo employees or hackers. KoopaTV was always going to have the family plan since it was promoted as a benefit, so this whole thing was unavoidable. Still nice of Nintendo to offer extra days on the trial, though. If it wasn't already made clear, a benefit to being in KoopaTV's staff is access to the family membership. Learn more about joining KoopaTV's staff here! This isn't the only secret benefit of Nintendo Switch Online. Now there's special SP versions of NES games, too. Not wanting to store credit card info on a gaming service is a super good idea. For a limited time, Nintendo offered an extra, second trial! The auto-renewal shenanigans is getting Nintendo some regulatory scrutiny. I am not sure what is more surprising- that Nintendo's free online trial extended for an extra two days or that you don't have a credit card. Me not having a credit card means that I'm not screwed by stuff like the Equifax hack! But if someone wants to do a credit check on me as a requirement for a loan or a job or whatever then yeah I won't have anything. Well, color me nonplussed. Can we count on more breaking information about just what this online service has to offer? I've gotten at least one conflicting account. Well okay, EXACTLY one conflicting account, either there's supposed to be a whole bunch of classic games available or just like a few dozen or so NES games or something. There are 20 NES games currently available, and 3 more will be added every month for the foreseeable future.